thus allowing you to create an item that is truly individual and unique to you. Example of a past project from creation - to the polishing - to the installation. Our Bespoke Furniture Design service allows the option of having a piece made in a specific size as well as finished to your exact requirements. We can even help you create your very own design. Perhaps you would like to change the style of some scrolling or remove/add some carvings? The choice is yours and the options are practically limitless. If you would like to discuss an idea, or simply to find out more information,please give us a call on 020 3474 0092 for a no obligation discussion. This project was a large bespoke bookcase (2.5 metres high) that a customer wanted us to create to match the curved style and colour of their existing desk. A drawer front from the desk was supplied so that we could match the colour and pattern detail. 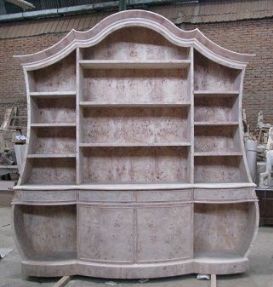 Below is the bookcase all made and now ready for polishing by our specialist finishers. Below the bookcase is all polished and finished and ready to be delivered to the customer. Below is the bookcase installed at the customer's home. 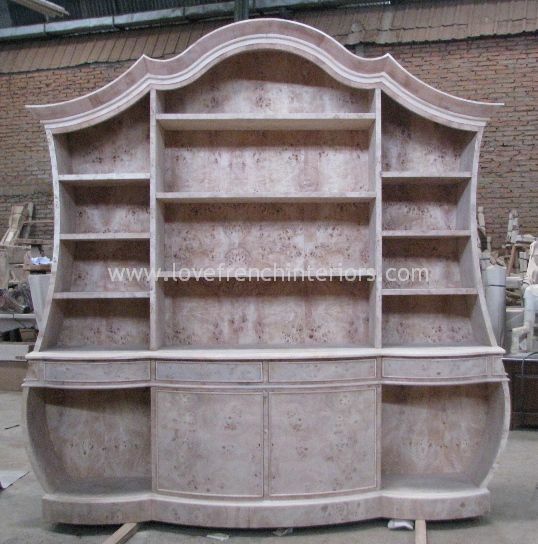 With its shaped cornice mouldings and side curves the end result is truly a work of art. 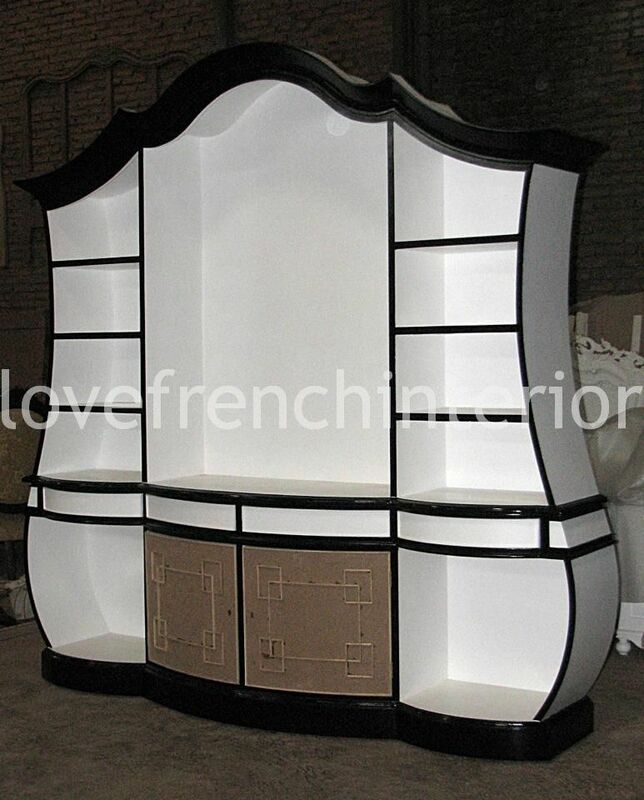 Below is the same style of bookcase but with a painted finish. CAD diagram showing two of our many bathroom vanity unit designs. The above vanity design was also adapted to make a sideboard. The finished sideboard with a polished mahogany top. 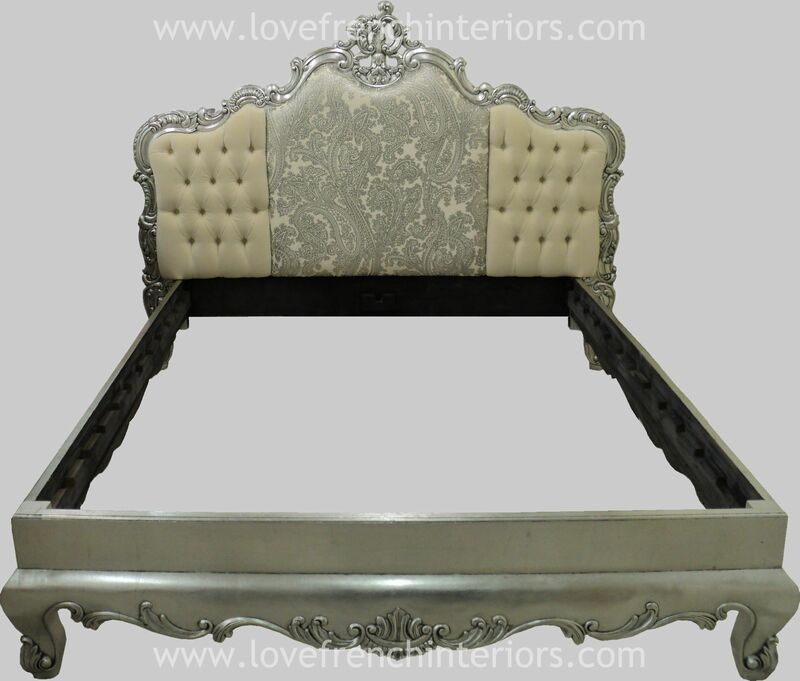 A stunning hand crafted bed finished in luxurious silver leaf. 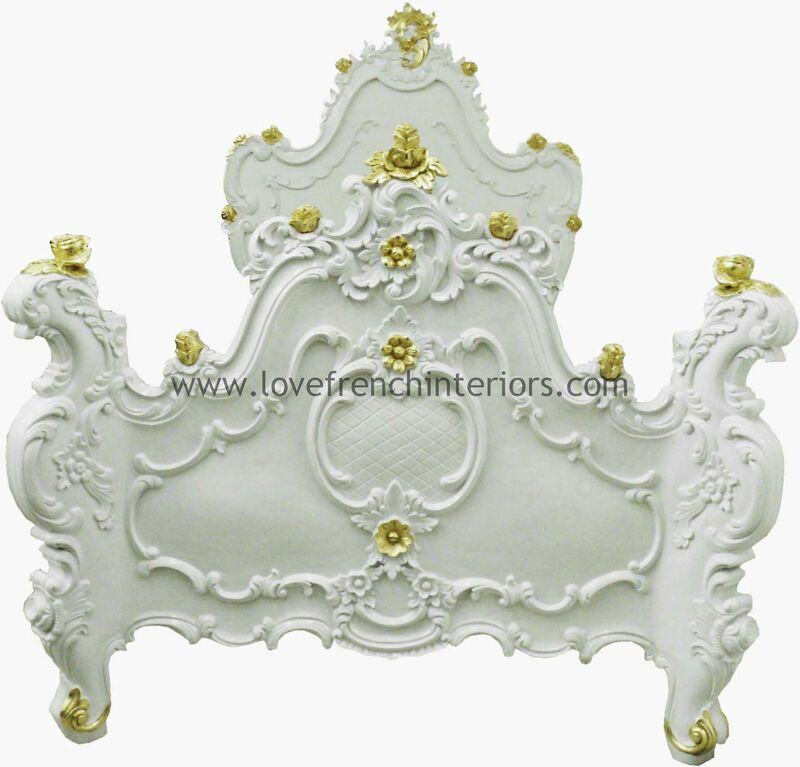 An ornately carved Rococo bed in silver leaf with extremely detailed carvings. Close up to show some of the detailed carvings on this console. A four door wardrobe without ornate carvings. An ornately carved mahogany Rococo single bed with gold highlights. A bespoke mahogany table with two concealed drawers and gold highlights. We work very closely with a select few manufacturers and suppliers in order to ensure that they produce a truly magnificent piece of furniture. 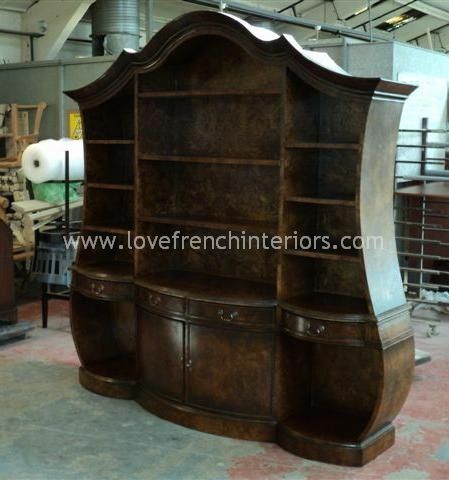 For example, we have suppliers in France who benefit from knowledge that has been handed down through generations and as a result are experienced at making exquisite furniture - some of which can be found in chateaux countrywide. Whether your requirement is big or small we can help. From small items like truly luxurious hand made cushions for use on settees and sofas through to large armoires, mirrors, sideboards and more. Whether you choose to adapt a piece from our range or create something totally new - the choice is yours. From the outset, we are happy to advise you on the fabrics and finishes available but should you wish to supply your own coverings for cushions, chairs etc then by all means you can do so - it is your project after all ! Naturally projects like this take time to come to fruition but the end result will be more than worth the wait. 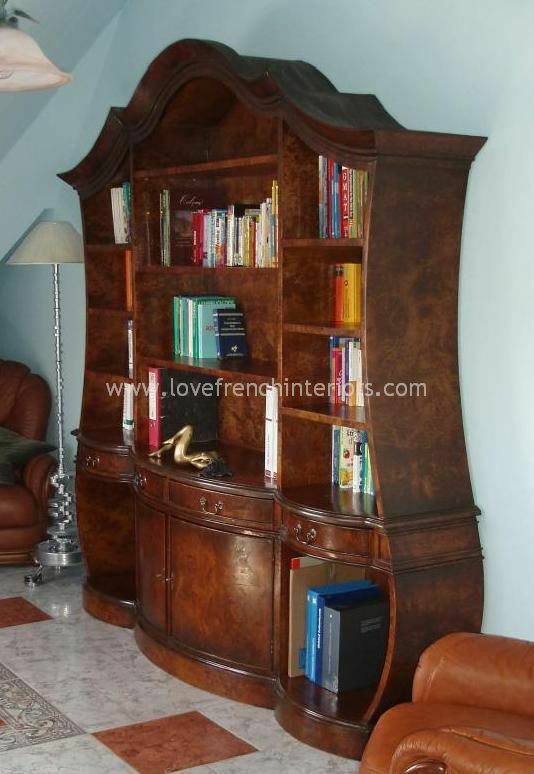 Be assured that Love French Interiors will jump through hoops to ensure that the end result exceeds your expectations. It goes without saying that we will liaise with you at each key stage of the design and manufacturing process and supply you with regular progress updates. 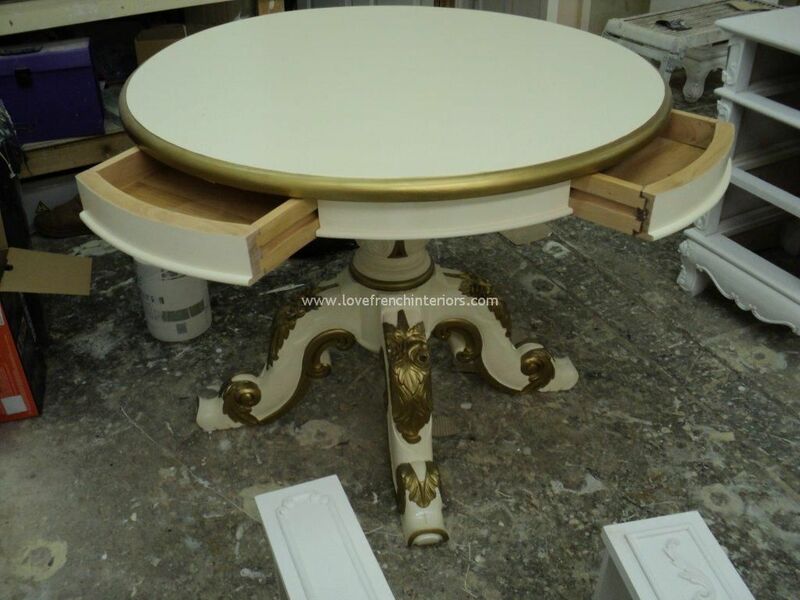 Love French Interiors also offers a full repainting service. 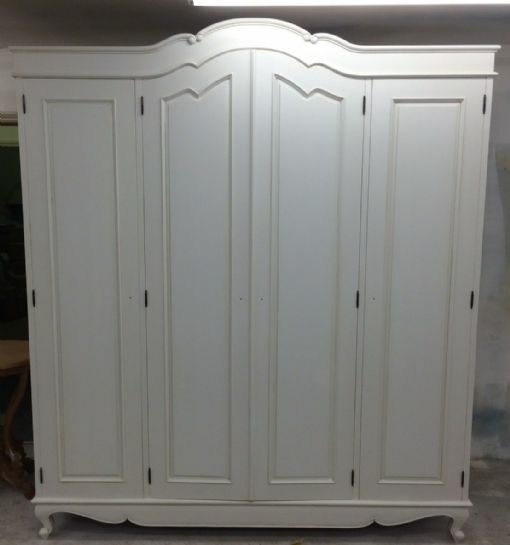 So if you have a cherished piece of furniture that is suffering from wear and tear or has an outdated finish and you would like it repainted in the same or even a new colour we can help. A popular choice is to have a polished wooden finish transformed into a lovely white but almost any colour is possible. Please note that for logistical reasons this service has a limited geographic area unless you have your own method of transporting the furniture to/from us. So if you would like to discuss an idea, or simply to find out more information, please give us a call on 020 3474 0092 for a no obligation discussion.